Winston Roots, Vol. 1: Stories of an Alabama County, by the Winston County Genealogical Society. Who was Aunt Jenny Johnston? Or Andrew Jackson Ingle for that matter? What is the "free state?" All of these questions and more are answered in the new book from the Winston County Genealogical Society, published March 29, 2010. First in a series, and more than two hundred pages, this book contains remarkable and historical happenings of Winston County during its many stages, even preceding statehood. It is a delightful retrospective on the discovery of Clear Creek Falls, the first permanent settlement, Byler and Cheatham Roads, early settlers, Revolutionary War soldiers, the organization of Hancock County, the renaming to Winston, the Civil War, Alabama’s oldest log jail, early mills, and many more all the way into the twentieth century. There is also an appendix of historical notes on nearly thirty towns and communities, some now called "dead towns." Winston Roots, Vol. 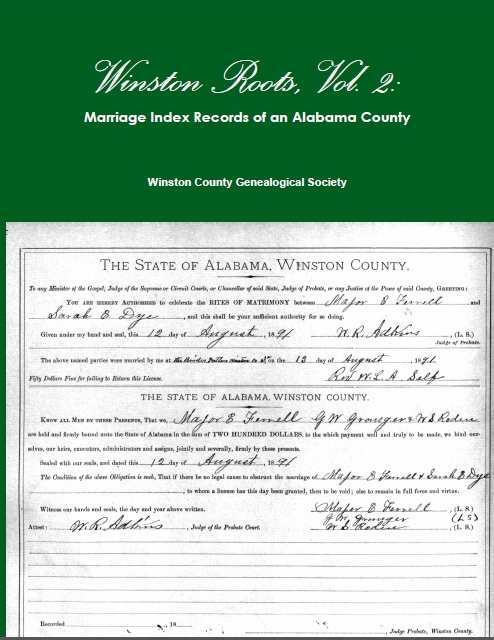 2: Marriage Index Records of an Alabama County, by the Winston County Genealogical Society. We bring you a valuable research tool for Winston County: an index to marriage records. This book contains an index of the first fifteen marriage books located at the probate office, containing not only a groom index, but in the second part of the book is a complete bride index as well. On August 5, 1891, a fire destroyed all the county books housed in the original courthouse. Over the years, the society has attempted to obtain a list of as many marriages as possible previous to 1891, providing more than one hundred of these marriages, included in volume two along with an appendix of notes and sources. Volume Two covers all marriages from August 1891 through early 1955. The index consists of the page number, the groom’s name, the bride’s name, and their actual date of marriage. ORDERING: The book can be purchased at the Winston County Archives in Double Springs Monday through Wednesday of each week, or you can purchase online by clicking the button below. Winston Roots, Vol. 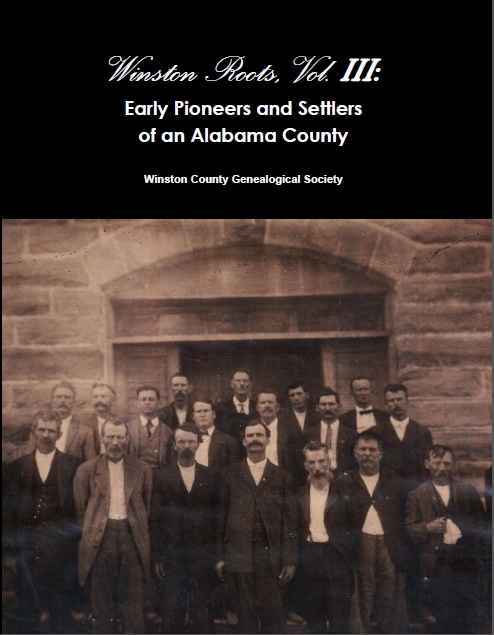 3: Early Pioneers and Settlers of an Alabama County, by the Winston County Genealogical Society. Alabama has lost several courthouses to fires and other tragedies, and Winston County is no exception. In August 1891, the Winston County Courthouse went up in flames, and along with it a good portion of historical documents. The historical collection of Winston County newspapers reveals hidden gems into our ancestor's lives which possibly cannot be found anywhere else. The Winston County Genealogical Society has actively been scanning and documenting articles from the newspapers collection, and during that process, the need of a book revealing Winston County's early settlers was realized. Winston County, Alabama is a county rich in history, and it is our hope this book will be a valuable genealogy tool for anyone interested in learning about their ancestors who came here to begin a new life in the rugged hills and hollows of the Free State of Winston. Winston Roots, Vol. 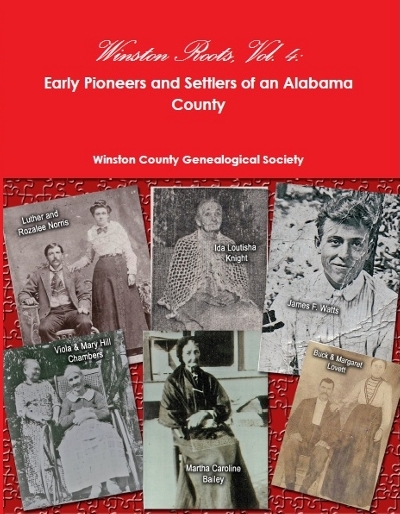 4: Early Pioneers and Settlers of an Alabama County, by the Winston County Genealogical Society. Winston Roots, Vol. 4 is the latest installment of an ongoing labor of love for the Winston County Genealogical Society for the preservation of our beloved county. It is our goal and desire to insure Winston's pioneers and settlers are remembered and their stories are recorded for future Winston County citizens.